With its sleek styling and small footprint, the TapeShooter 404 is an attractive sealing device that fits in well on any countertop. 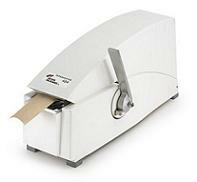 The lever-operated paper tape dispenser simplifies many specialty sealing applications and ensures a secure, professional seal. Reliable Sealing for Specialty ApplicationsTape Shooter 404 * Food service establishments such as sandwich shops, pizza restaurants and bakeries * Supermarket deli, seafood and meat counters * Meat packing facilities * Mail rooms and packing stations * Floral retailers and wholesalers Professionally Seal a Multitude of Boxes, Containers and WrappingsBoxes Sealed with Paper Tape * Uncoated corrugated or cardboard boxes * White butcher wrap and freezer paper * Corrugated wrap * Kraft wrapping paper * Void fill paper, such as Bogus paper * Uncoated pizza boxes and floral boxes Specifications Dimensions: 14" L x 5 " W x 7 " H (35.56 cm L x 12.70 cm W x 17.78 cm H) Shipping Weight: 7 lbs. (3.18 kg) Tape Roll Capacity: 1" to 1-1/2" wide (2.54 cm to 3.81 cm) Up to 500' length roll (152.40m) Tape Type: 35lb, gum-side out, non-reinforced, available in white or natural Dispensing Length: Up to 8" with one lever stroke (20.32 cm) Blades: Guillotine shear blades Wetting System: Enclosed water reservoir with brush design Warranty: 2 year parts, 6 months labor Important Service & Repair Note: Be sure you are purchasing Authentic Better Packages parts and supplies from an Authorized source. When servicing a Better Packages product, only genuine Better Packages replacement parts should be used. Parts from other sources will void all existing warranties and any UL, CE, CSA certifications. Parts not manufactured by Better Packages may also create a safety hazard as well as diminished product performance. SPECIAL ORDER ONLY! NOT A STOCK ITEM!